The first thing that comes to mind when I think about a home generator is keeping my family comfortable in the event of a power outage. Whether you live in an area that is prone to power outages or only experience outages a couple of times a year, having a backup generator is a no-brainer. At the very least, an outage is inconvenient, but power outages can also have a real and serious impact on your safety, security and wallet. Imagine the power has been out for several hours. You're concerned about the items in your refrigerator and separate freezer in the garage. It's also the middle of summer and sweltering outside. You're facing the prospect of having to book a hotel room because it's just not comfortable or safe to stay home overnight without power. The cost of a power outage can quickly add up without a backup power source. Installing a home generator pays for itself over time. If you have a basement, you know how important it is to keep the sump pump running during severe weather conditions. Having a generator could be the difference between dealing with mold mitigation, contractors, insurance companies, etc. and getting back to living your normal life after a storm. Many smart home devices are battery operated so your security system will continue to work in the event of a power outage. However, your security may be at risk in the event of a prolonged power outage. Some alarm system backup batteries last 24 hours. Now you're left hoping the power comes back on within that time frame. Also, some smart home devices will continue to work on battery power but with limited functionality. Installing a home generator keeps your home secure by powering security devices during a power outage. Here's the deal. Statistics show you will likely recoup 54% of the cost of a standby generator within a year. However, the value to a buyer can't be measured and extends beyond the money. When a buyer looks at similar homes in the same neighborhood, it's important to have a differentiating factor to give you an edge over the competition. There has been a noticeable shift in buyer mindset from when I started in real estate in 2003, a time when fixer uppers seemed to rule the real estate market. Today, buyers look for a move-in ready home they can make their own with minimal work. They want to spend weekends going on hikes or exploring their city instead of living in the chaos of major renovations. A home generator could be the deciding factor for a buyer when choosing between your home and the one down the street. A home generator is a purchase requiring a good amount of research. Prioritize your needs to determine the type of home generator you need. Do you want a portable generator that powers only essentials or a standby generator that powers the whole house? A portable generator is less expensive, but it has some drawbacks. Portable generators must be manually operated so you need to be home to turn it on and it requires you to continually fill the tank with fuel. You must also place a portable generator at least 15 feet away from the house to prevent carbon monoxide from entering the home. A standby generator is permanently installed and connected to an external fuel source like natural gas. It will kick in whether you are home or not, and you have the option to monitor and control it using a mobile device. 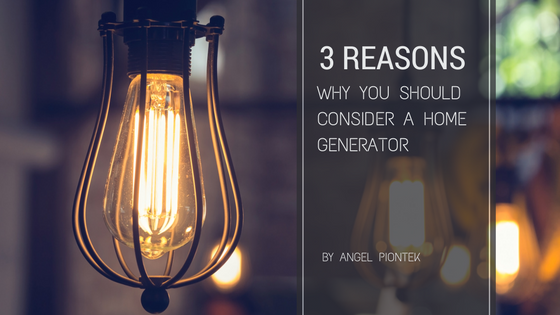 A standby generator is a considerable investment, but has a much better value and ROI to a prospective home buyer than a portable generator. If you're a buyer and the seller is offering a portable generator as part of the sale, you need to remember this is considered personal property. In order to ensure that it conveys with the sale, you should get it in writing. There are many wattage calculators online to help you determine how much power you need for your home. Check out Cummins calculator to get an idea of your needs and to help you think about what items you would like to power during an outage. Simply input your home's location, square footage and power needs. If you are still unsure what type of home generator is best suited for your home and family, consult the professionals to get an accurate assessment. A standby home generator is a great addition to any home for safety, security and convenience. While this post is sponsored by Cummins, Inc., all of the opinions are my own and I'm happy I can help you with improving your home!